When I arrived on Holy Isle in September 1999 Lama Yeshe Rinpoche, the Retreat Master, gave two instructions to guide me during my year of retreat. One was to not do anything unless I could rejoice. This was not what I had expected to hear and I can remember leaving his presence with a sense of joyful anticipation. A subtle instruction, if ever there was. And yes, some days it is easier to rejoice than on others. 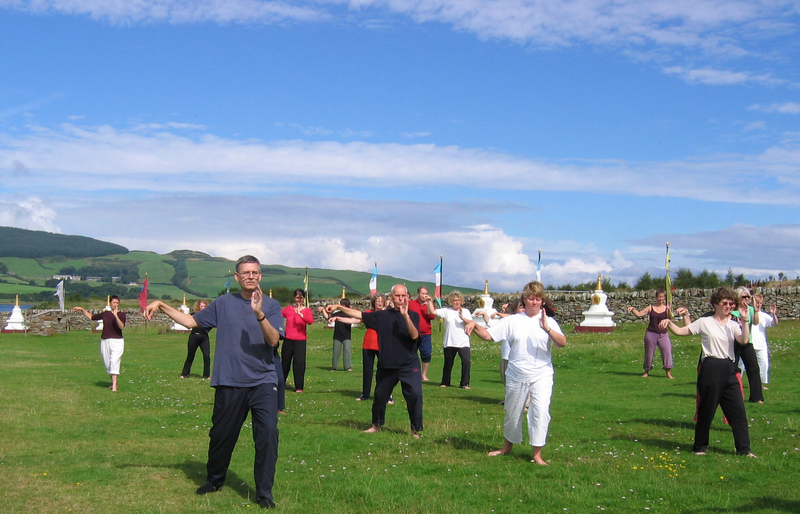 I have been leading Qigong & Meditation Retreats on Holy Isle since the Centre opened in 2003 and Lama’s instruction hovers around my heart as I meet and teach the participants on these courses. Many are coping with changes in their lives that diminish their ability to rejoice. Coming to Holy Isle offers respite from the pressures of every-day life. Over the week (or a weekend) the healing movements of Wild Goose Medical Qigong alongside the simple loving kindness and peaceful mind meditations we practice together enable deep relaxation to arise. The releasing movements of Wild Goose recharge the qi, the life force, and the peace of the sitting meditation sessions allows the mind to have a holiday in peace. The ethos of Holy Isle is friendship. As well as the Qigong and meditation we practice together the island itself is restorative: I have seen participants choose to climb the mountain when their greatest fear is of heights – and come back filled with glowing confidence! On every course that I have run on Holy Isle, be it a week or a weekend, I have witnessed transformations that are truly healing. Participants arrive as strangers and rapidly and naturally they weave friendships based on mutual support and kindness. One of the requests made of participants is to help in the kitchen with the cleaning and washing up and I always hear laughter from the group joyfully working together. 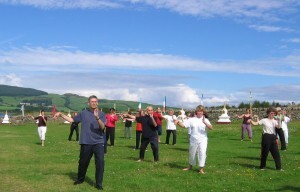 Holy Isle is an excellent place to rediscover our ability to rejoice. And the other instruction given to me at the start of my year retreat by Lama Yeshe? I’ll tell you when next we meet on Holy Isle! Mindfulness is a hot topic these days as it becomes increasingly recognised as an effective way to reduce stress, deepen self-awareness, enhance emotional intelligence and effectively handle painful thoughts and feelings. So what is it?